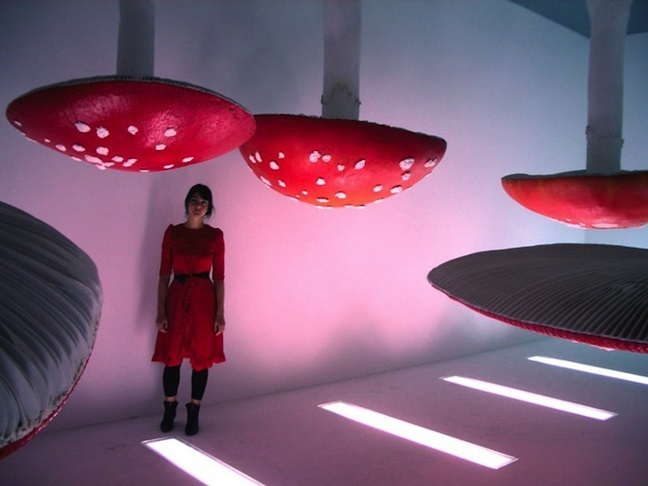 Carsten Höller exhibits with the Gagosian Gallery, during Frieze Art Fair 2014. 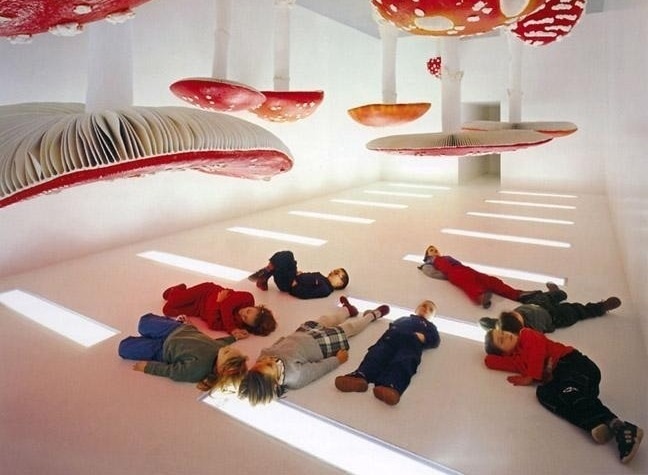 In this context you can see Höller’s installation that mimics a playground for children. 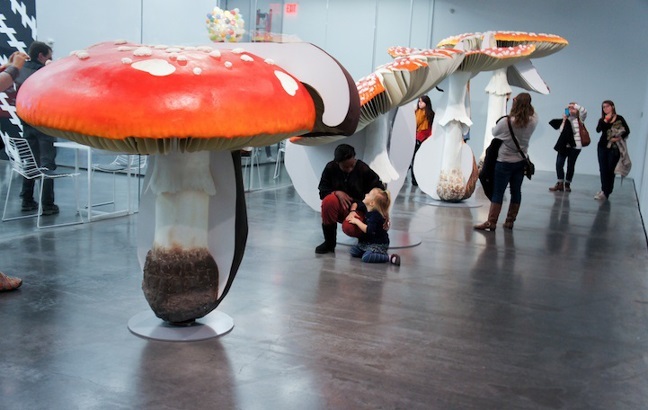 Within it, visitors will find giant mushrooms that are asking to be played with. They rock from side-to-side. 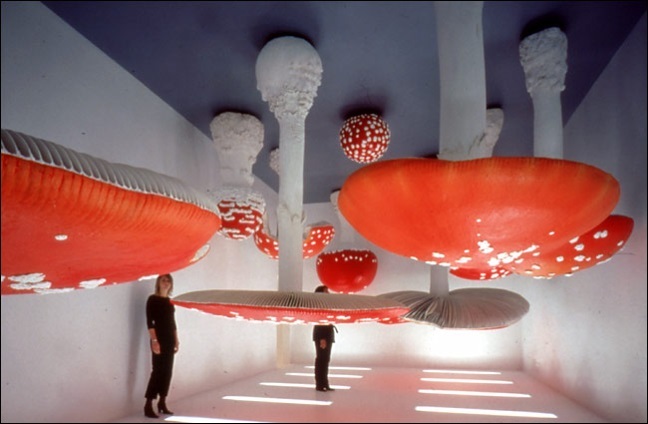 Carsten Höller uses his training as a scientist in his work as an artist, concentrating particularly on the nature of human relationships. Born in Brussels in 1961, he now lives and works in Stockholm. His major installations include Test Site, a series of giant slides for Tate Modern’s Turbine Hall (2006), Amusement Park—an installation of full-size funfair rides turning and moving at very slow speed at MASS MoCA, North Adams, USA (2006), Flying Machine (1996), a work which hoists the viewer through the air, Upside-Down Goggles, an experiment with goggles which modify vision, The Double Club (2008–09) in London, which opened in November 2008 and closed in July 2009, took the form of a bar, restaurant and nightclub designed to create a dialogue between Congolese and Western culture. His Revolving Hotel Room, 2008, a rotating art installation which becomes a fully operational hotel room at night, was shown as part of “theanyspacewhatever” exhibition at the Guggenheim Museum in 2009. His works have been shown internationally overthe last two decades, including solo exhibitions at Fondazione Prada, Milan (2000), the ICA Boston (2003), Musée d’Art Contemporain, Marseille (2004), Kunsthaus Bregenz, Austria (2008), Museum Boijmans Van Beuningen, Rotterdam (2010), Hamburger Bahnhof, Museum für Gegenwart, Berlin (2011), New Museum, New York (2011) and TBA 21, Vienna (2014). In summer 2015 he will have major exhibitions at Hayward Gallery in London and Centro Botín in Santander.